Do you still use print cookbooks? Have we all converted to online sources exclusively? Can a cook have too many cookbooks? I'm not ready to abandon print on paper. Even though I own far too many cookbooks, I still long for more. January's cookbook swap announcement seemed the perfect invitation to set one of my treasures free, and welcome a new one to my overcrowded shelves. (link) A side benefit would be the introduction to two new-to-me food bloggers and their stories. “Participating in the Food Blogger Cookbook Swap, hosted by Alyssa ofwww.EverydayMaven.com and Faith of http://www.anediblemosaic.com , I sent a cookbook to a food blogger and received this cookbook in return!” That sounds easy enough, but it took more time than anticipated. I rediscovered cookbooks that I hadn't looked at in ages; books I read through once like a novel, perhaps tried a recipe or two, and then put aside for "another day". Well, another day is here and I've paged through w-a-a-a-y too many books, marking scads of recipes I really do want to try this time around. Sigh, too many cookbooks, too little time. What an interesting challenge to find "the" book, a book in near-new condition with no scrawled notes or food splatters decorating its pages, a book with an engaging story as well as recipes that might fit specific dietary preferences. I spent several days doing a little research, skimming through the recipe index on the assigned site and finally chose a cookbook for another blogger to enjoy. Book selected... book mailed... and then I waited. Anticipation grew as I waited to hear the "clunk" of a package hitting the mail slot. It didn't take long for my book swap package to arrive. 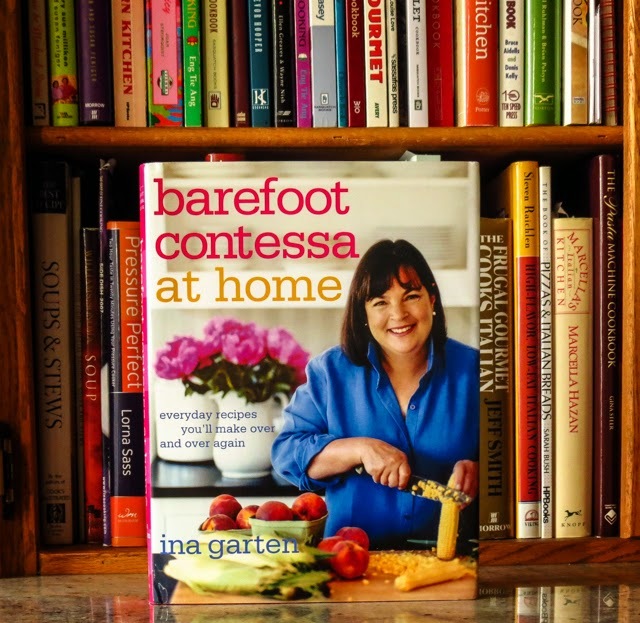 Kristina of CucinaKristina shared Ina Garten's Barefoot Contessa: at home as my cookbook swap treasure. Thank you, Kristina, for your friendly note and choice of cookbooks. The beautifully photographed book presents everyday recipes for family and friends, homecooking with great flavors and minimum fuss. It has been fun comparing some of my own tried and true recipes with Ina's versions of the same. 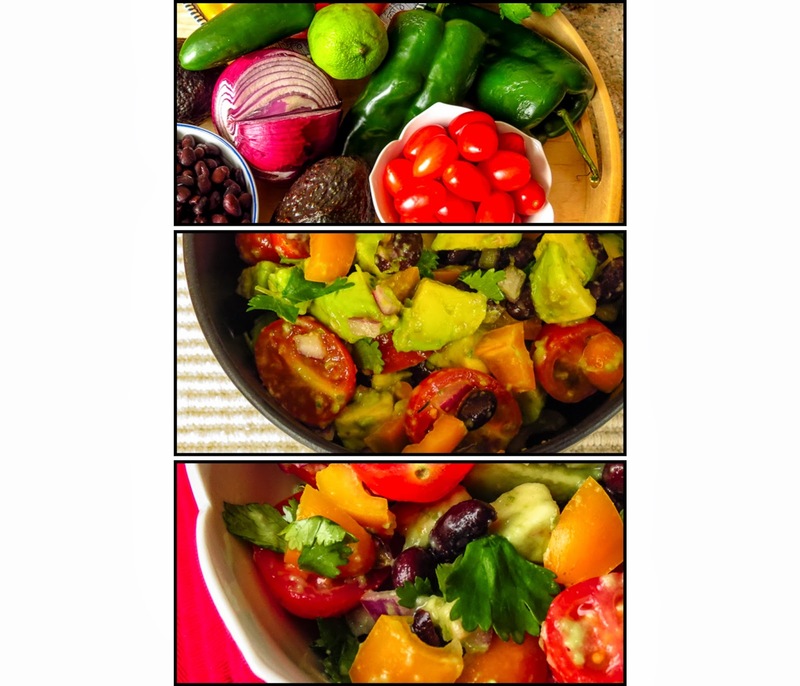 I adapted Ina's Guacamole Salad to share here, a dish that mixes the flavors and ingredients of a great guacamole and a Southwest Corn Salad with Black Beans (without the corn). Place the first 7 ingredients in a large bowl, tomatoes through lime zest. In a small bowl whisk together the sauce, lime juice through cayenne. Pour over the vegetables and toss well to coat. 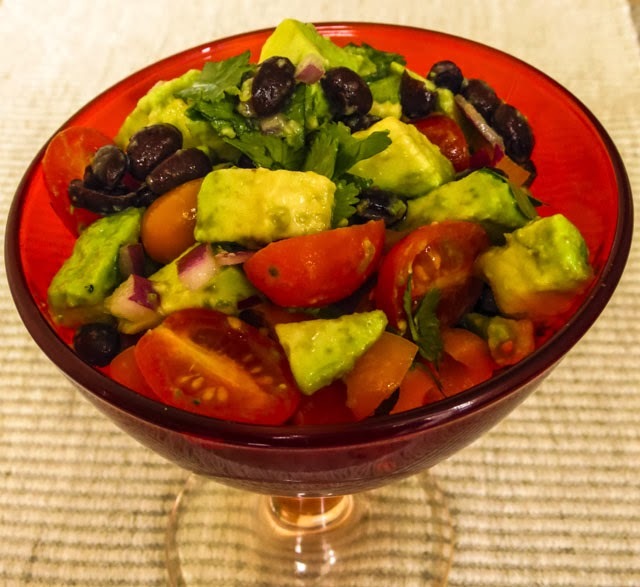 When you are ready to serve, fold the avocados gently into the salad with a wide rubber spatula. Taste and adjust seasonings. Sprinkle with cilantro and serve at room temperature with optional hot sauce and salsa on the side. Note: Leftover salad worked well to fill Tostitos tortilla cups as an appetizer or snack. Too many cookbooks? Here are some organizational solutions. I love all things having to do with Ina Garten and would love to add this book to my shelf. Hope you enjoy it! Ditto on the Ina love! Thank you so much for participating in the swap and helping to make it a success! I love Ina's recipes and this salad looks amazing! Faith, this was a terrific activity, gaining each of us a new cookbook to enjoy and links to new and interesting bloggers. Thank you and Alyssa for co-hosting. What a great book - Ina never lets me down! Thanks again for participating in the swap! My pleasure, thank you for organizing this event. I'm still having fun exploring the other participating blogs. Ina is the best and so are her cookbooks! What a fabulous salad! Great adaptation and book to receive! It has been so fun to discover new blogs, and new treasures in cookbooks! Thanks, Christy, this HAS been a fun event.